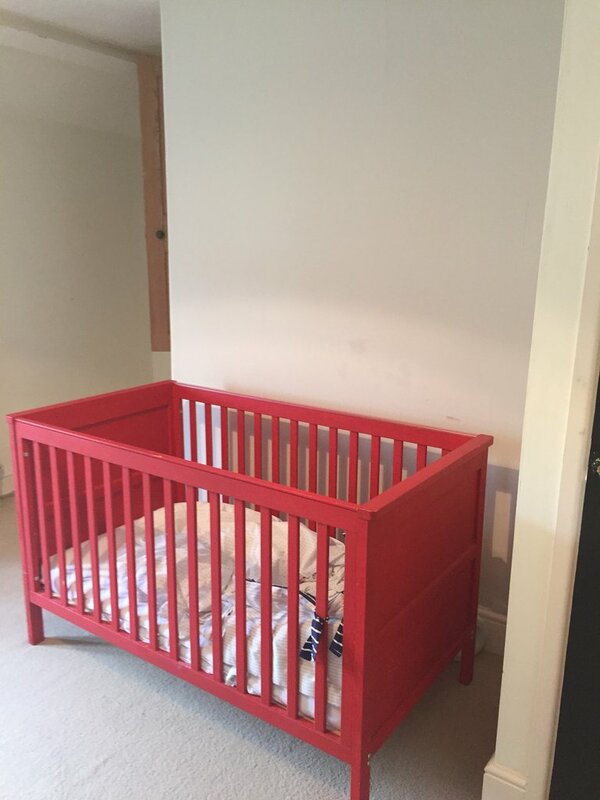 So to kick off another DIY post, I thought I would quickly explain why there has been a bit of radio silence on the blog recently. 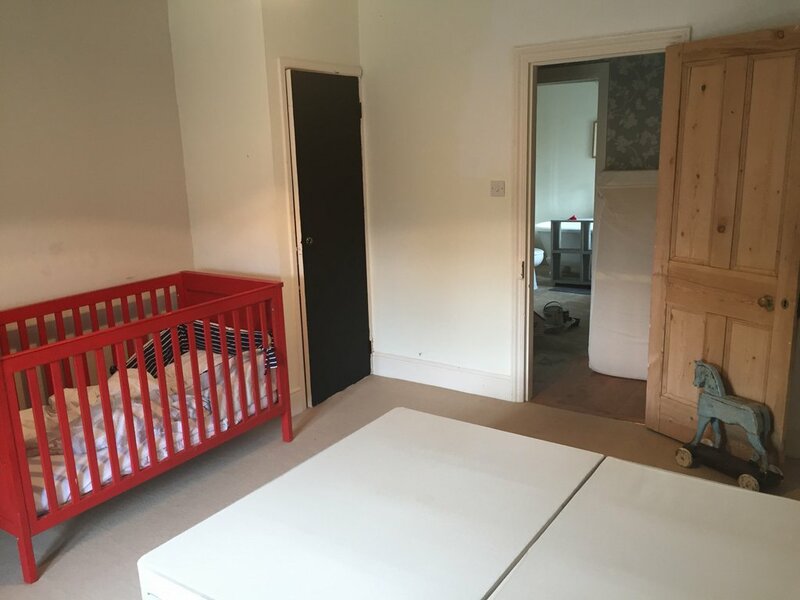 We have been busy renovating Oscars room and it all began when I hastily ripped up the carpets last month. 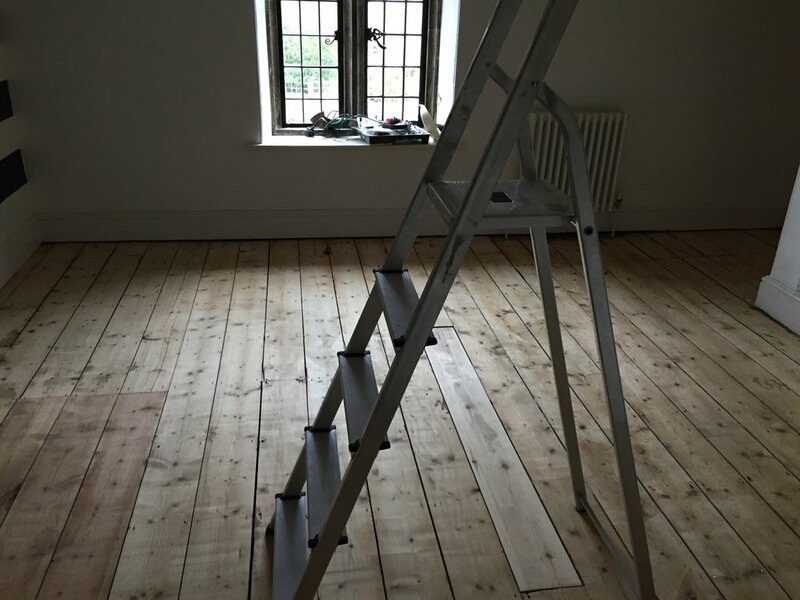 Here are a few things I have learnt from sanding floors and for any of my readers considering doing the same thing, well be warned, its messy, its noisy, and its sure to cause marital disharmony. 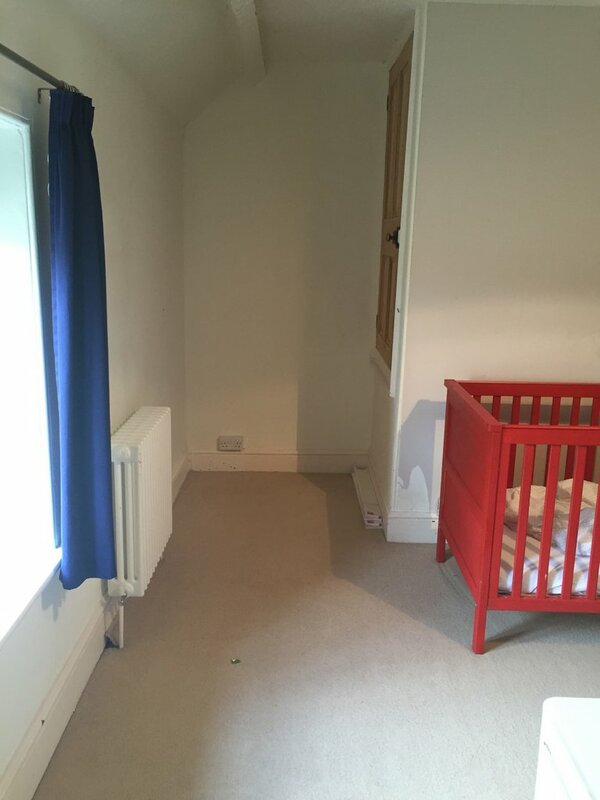 This was the room before. 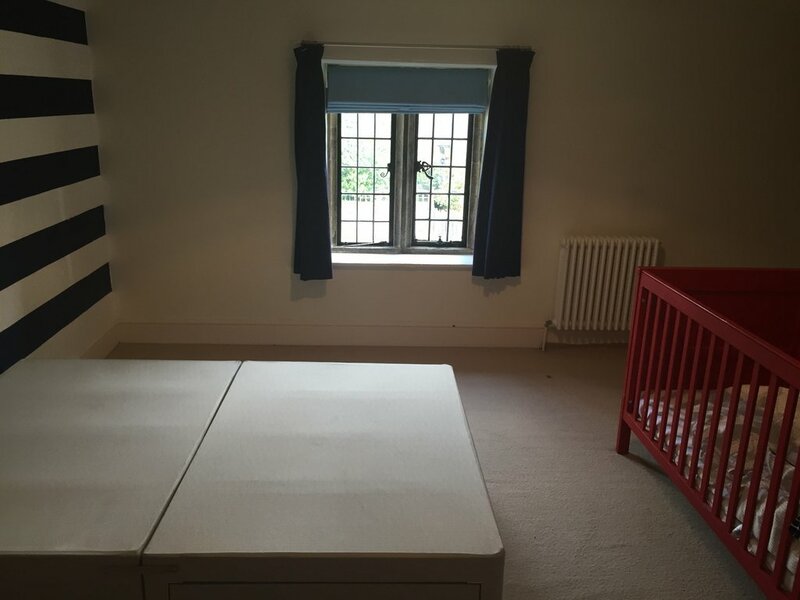 I managed to get a photo of the room before I took all the furniture out but linen, mattress and most pictures missing - poor Oscar, makes us look like we were totally neglecting his room. 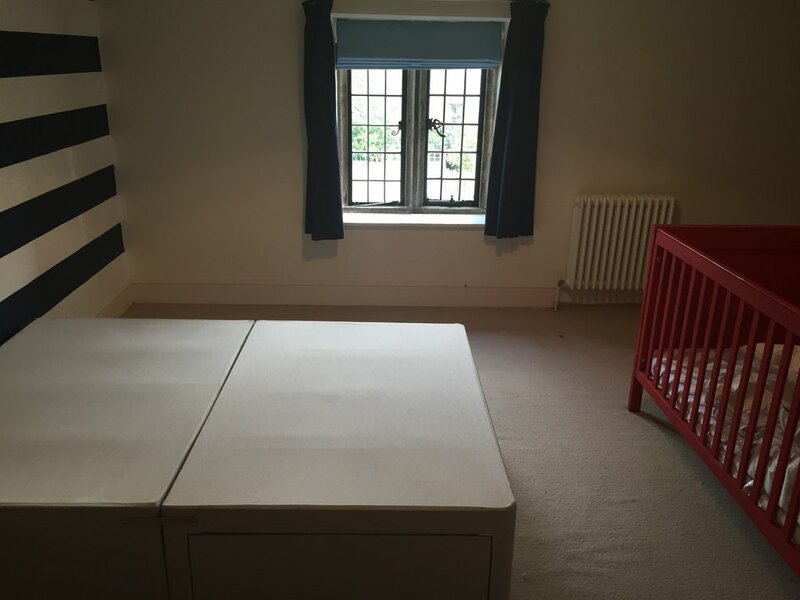 It didn't look that bad, but there's no denying that the room needed a little revamping. 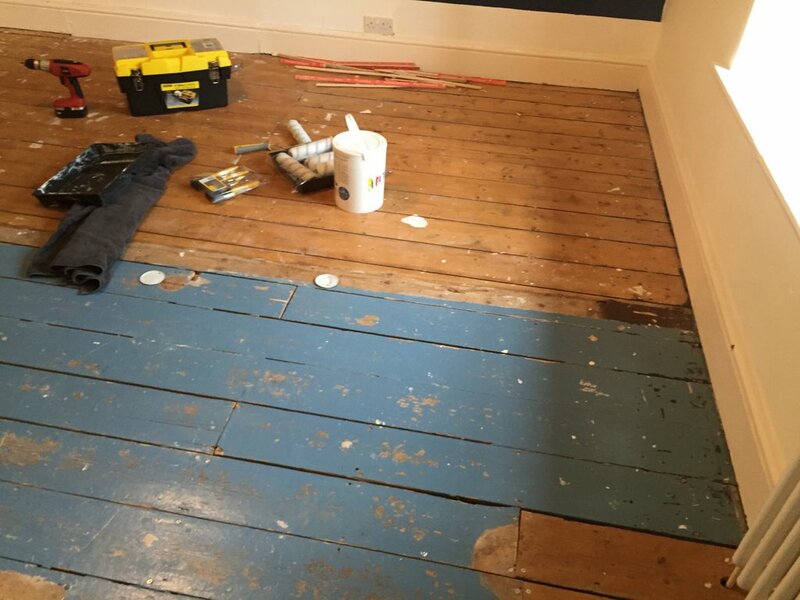 All was looking dandy when I ripped up half the room, floorboards looked to be in great condition. And I plucked up the courage to text the husband to tell him (actually I instagrammed it and tagged him in it - pretty much the same thing right? ) Then I started ripping up the other half and I started seriously regretting what I did, and fearing what my husband would say or do. 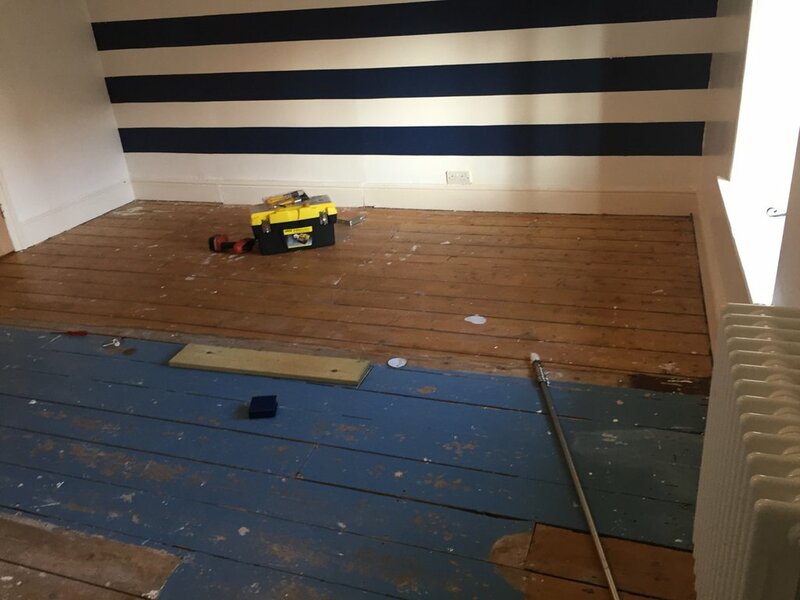 It seemed like there was once a bathroom in the other half of the room so loads of pipework holes in the floorboards and a some VERY OLD paint, about 40 layers of it. 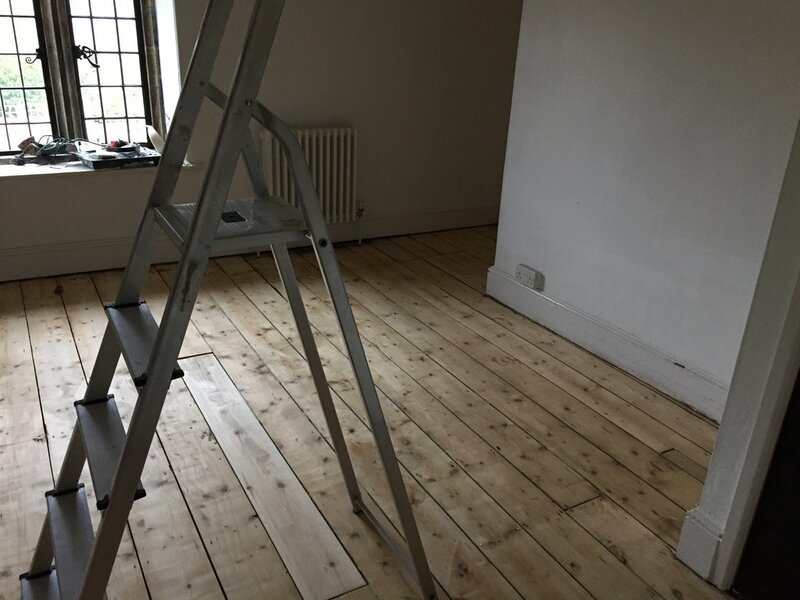 My dream of having natural stained floorboards were gone, and I knew that I would have to cook the husband his favourite dinner that night (filet steaks and chips) just in order to curb the looming reprehension I was about to receive. 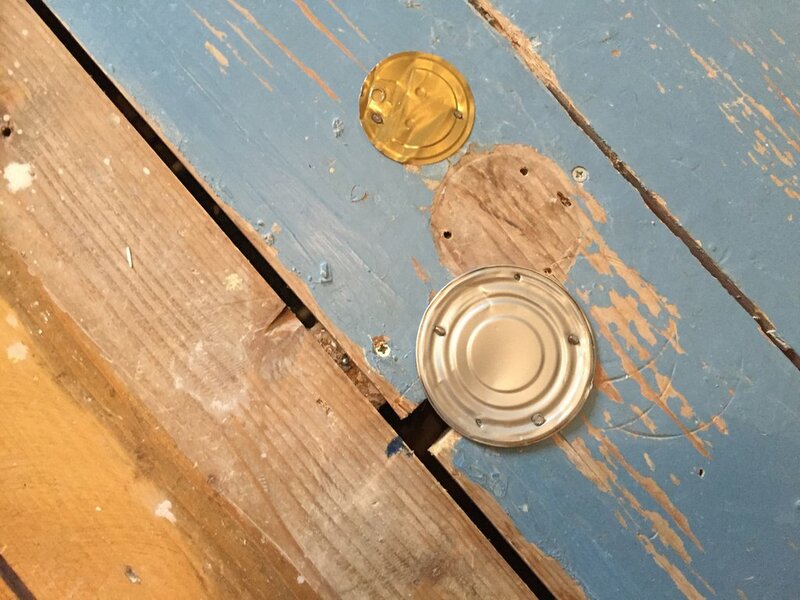 They had also for some reason used old tin cans to hide the holes in the floorboards, probably to stop most of the draught coming up. So next step was to hire a Sander and find some floorboards to replace the ones with holes in it. JVC hired me a giant floor sander and an edging sander as well along with sanding papers that came in varying grits - coarse,medium and fine. The floor sander was heavy like extremely HEAVY so when the husband got home the next evening, just about to sit down to enjoy a glass of wine, he was made to take this giant sander up the stairs, and lets just say he was still not pleased about the situation. I knew I was gonna have to make that room look fabulous coz there was no going back now. That and the fact that if the sale of the house didn't go through, I was gonna have to convince the landlords that what I did was for the benefit of the house and that it looked much better than it did before. We had a few issues with the first sander we hired. The sanding paper was to be attached to the bottom of the sander with nuts and bolts and I realised that we were missing some of the nuts and bolts. I was terrified that we were gonna have to pay a ridiculous amount of money to get it fixed and that we had broken it and after a rushed trip to many specialised hardware stores I was told that those nuts had a very obscure type of thread and that they couldn't match it. SO back to the hire store, and he gave me the right bolts (at no charge) and set off home again. I would also like to point out that this was the same morning that my nanny told me she had broken her wrist and that she wasnt gonna be able to come into work for a few weeks. (My husband was raging at this point.) 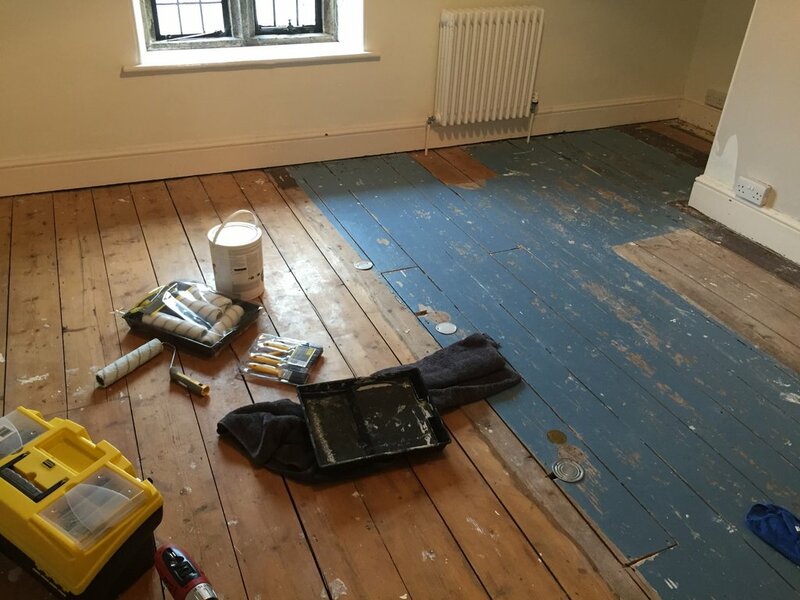 So when H went off to preschool, and O had gone down for a nap I got to work on ripping the carpet grippers up, and tightening down any floorboard nails that were sticking up. 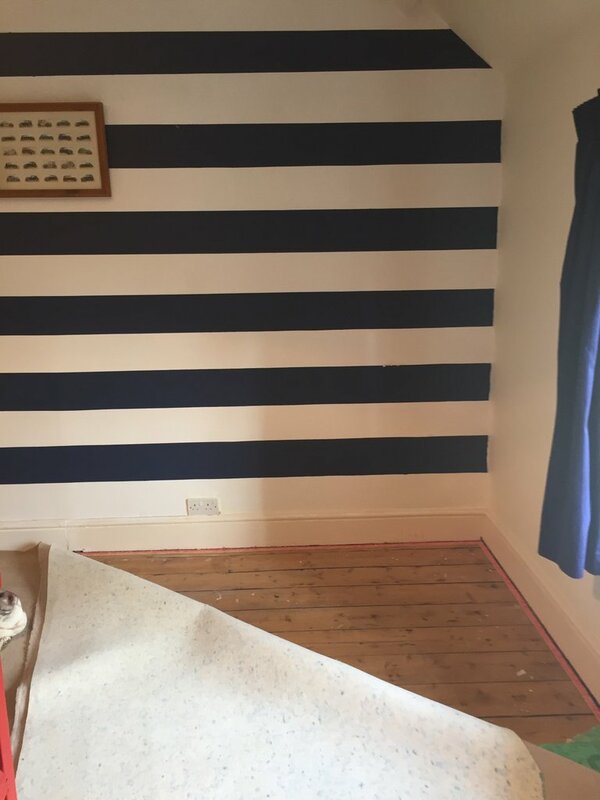 I also started using the edging sander to start doing the corners and edges of the room but soon realised how bloody noisy it was. I also fixed the floor sander with the new bolts and got it working so started with that as well. O happily he gave me an hour and half to do it while he napped. My back and thighs were aching and felt like I had run a marathon after only an hour. Laborious doesn't even begin to explain the work thats involved and by that point I was kicking myself that I hadn't hired someone to do it for me. I can be a stubborn little bull sometimes, that and the fact that I love making challenges for myself. O soon woke up, but with the edging not even half complete I felt defeated by the enormous task I had set myself. So again, husband gets home that night, and with my tail between my legs, I had to ask him very nicely if he wouldn't mind finishing some of the sanding while I bathed and fed the children. ( I won't tell you what his response was but lets just say in the end he did it for me like a true champion husband - pulling me out of the deep end again). Within 20 minutes he comes down stairs to say its not working - turns out the bolts weren't tight enough and they scuffed on the floorboards which meant we had effectively broken it again. Urgh.. I panicked again as I was worried we had paid to hire the sander for all this time and hadn't even done half the room. That and worried we were gonna have to pay up to get the machine fixed. So back to JVC the following morning to tell them what had happened. 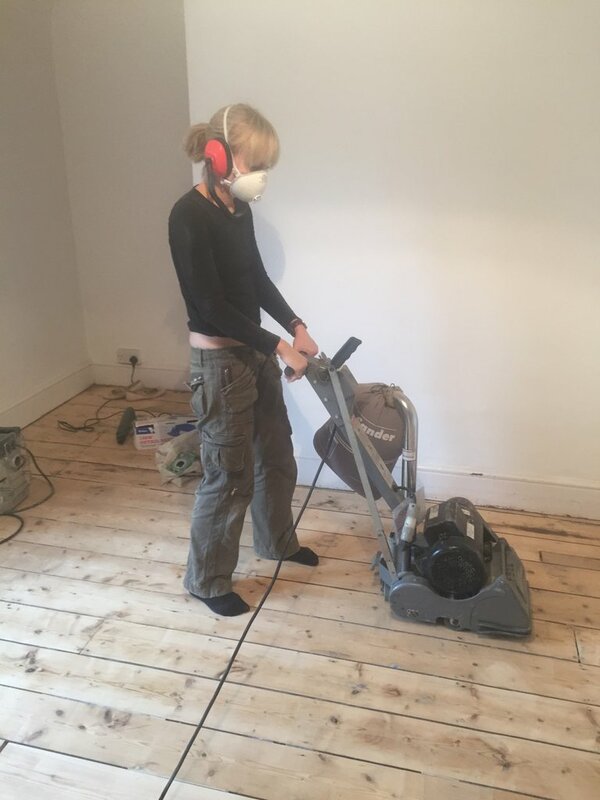 The guy was so sweet, and with a little flutter of my eyelashes and an innocent smile, he kindly allowed me to rent the sander on the Friday instead, and he wasn't gonna charge me for the 48 hours that we had already had the sander. He also let me keep the edging sander so that I could perfect the finish. He said that the edging sander was good to use for any spots that we missed with the floor sander, and boy was he right. 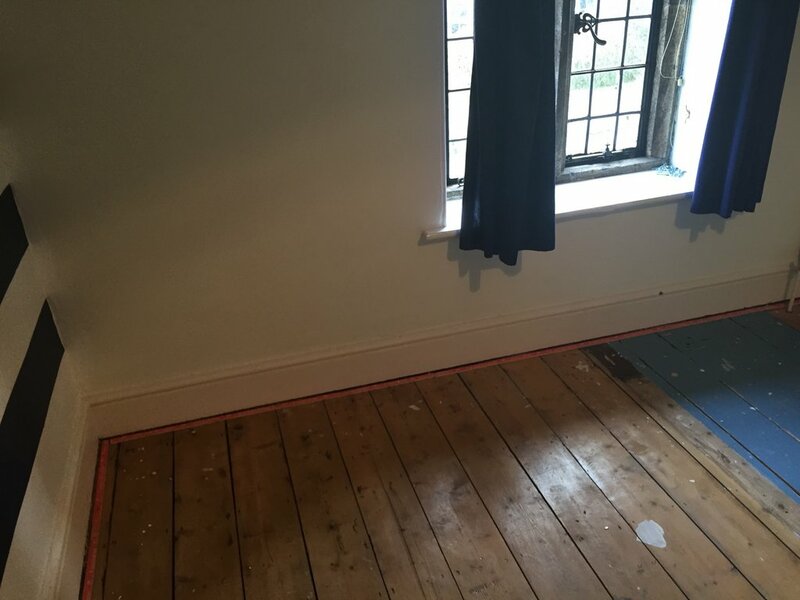 Especially with an old house, the floorboards were incredibly uneven. He also said that it probably wasn't us that broke the sander (phew!) and said that these were incredibly fiddly and that he would provide us with another foolproof model when I was to return on Friday. 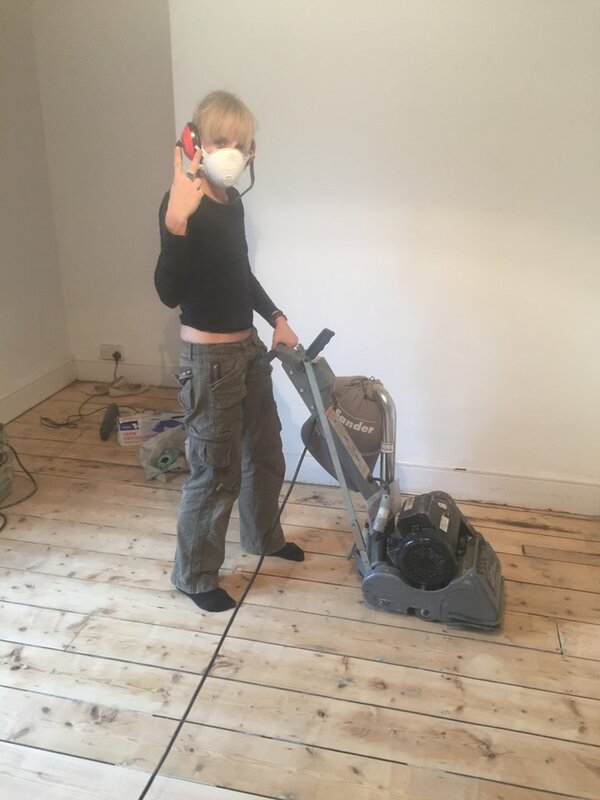 This was a vital game changer for us - and if you are thinking about hiring a floorsander, ask for one with circular tube sanding papers - not the type with the nuts and bolts. Far less fiddly and a much smoother machine which means your arms don't vibrate and ache so much. 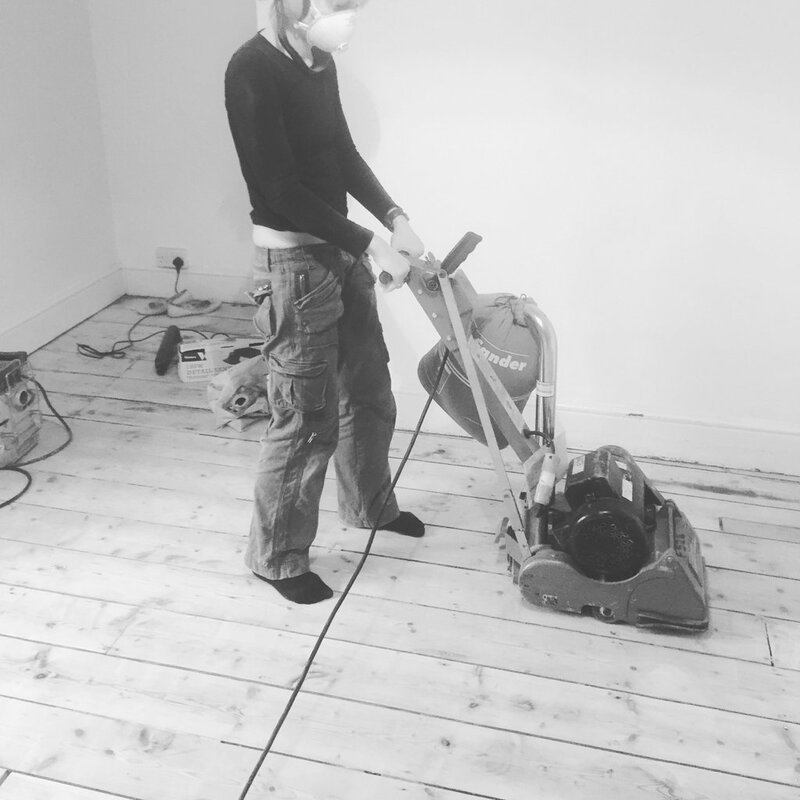 With the sander being picked up on Friday, Will and I alternated on the sanding and worked our way across the lengths of the room. Dust everywhere! I mean everywhere. Even in other rooms which we still can't work out how that happened as we made sure the door was always closed. 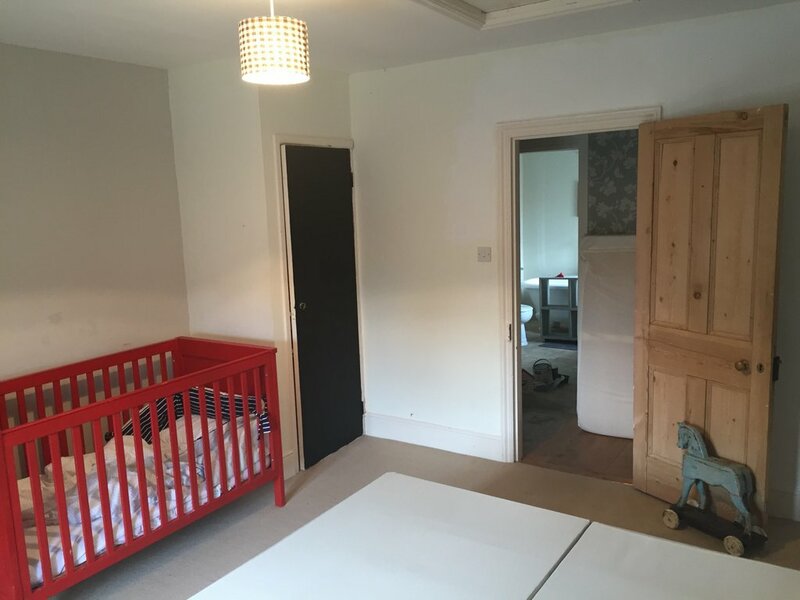 Not really sure how you could avoid that - and the idea of having to put a sheet up seemed like far too big a job and we didn't have time for mucking about. I would also recommend a pair of ear protectors and a dust mask. I really need to emphasize what an unpleasant job it is, but equally its very satisfying. 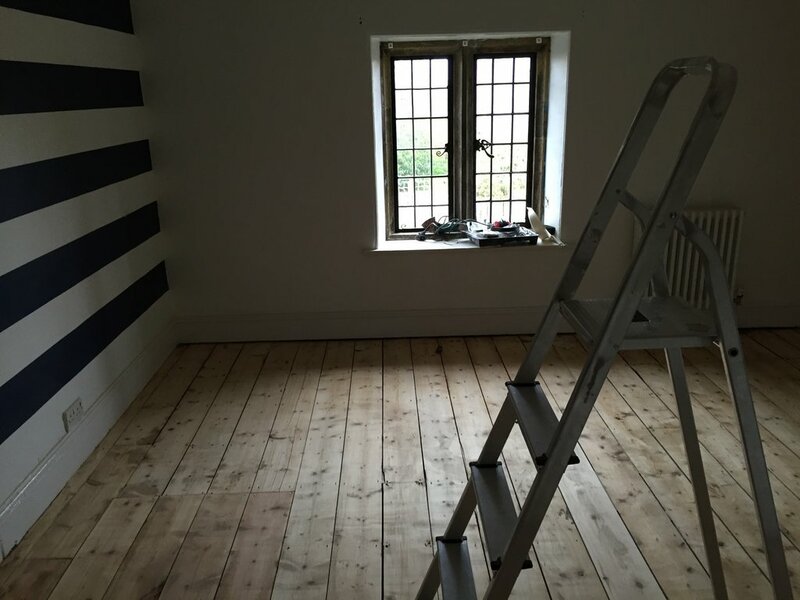 After a full weekend of incredibly noisy sanding, we had finally sanded the room. Hooray! It felt like such a big achievement and I could finally let out a sigh of relief. But the job wasn't over. 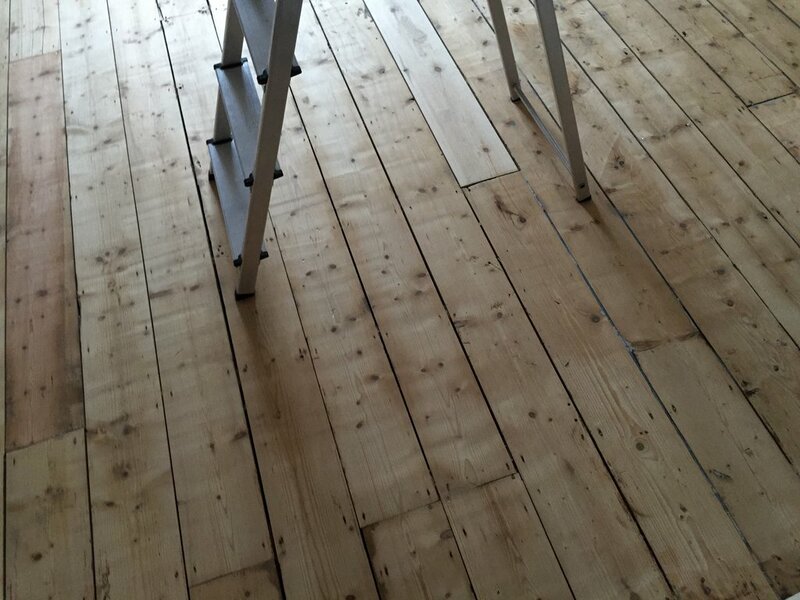 we had to replace the floorboards that were no good, and I went to a local timber store to get some lengths of floorboards after measuring up the old ones. (I did look at getting reclaimed ones to match, but looked at the budget and didn't think it was worth it). 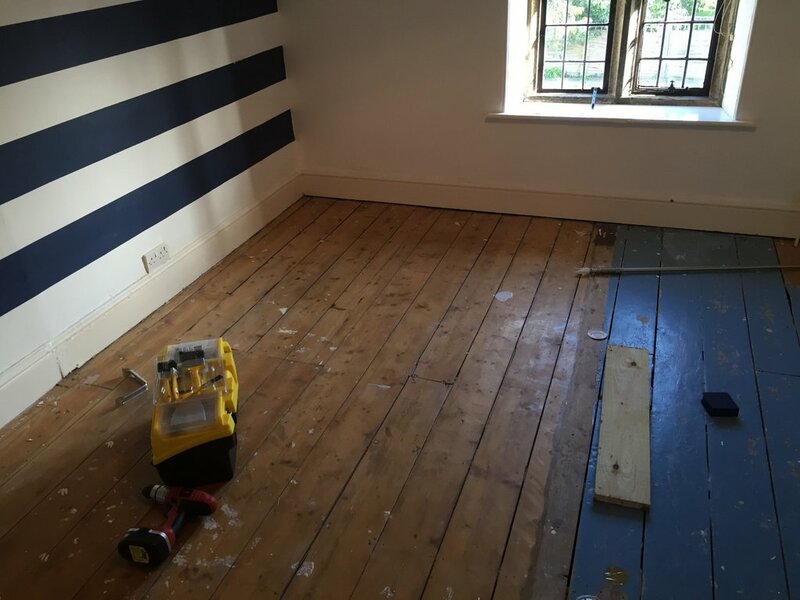 We also couldn't get some of the paint off in the far corners of the room so it made more sense to paint the floorboards. 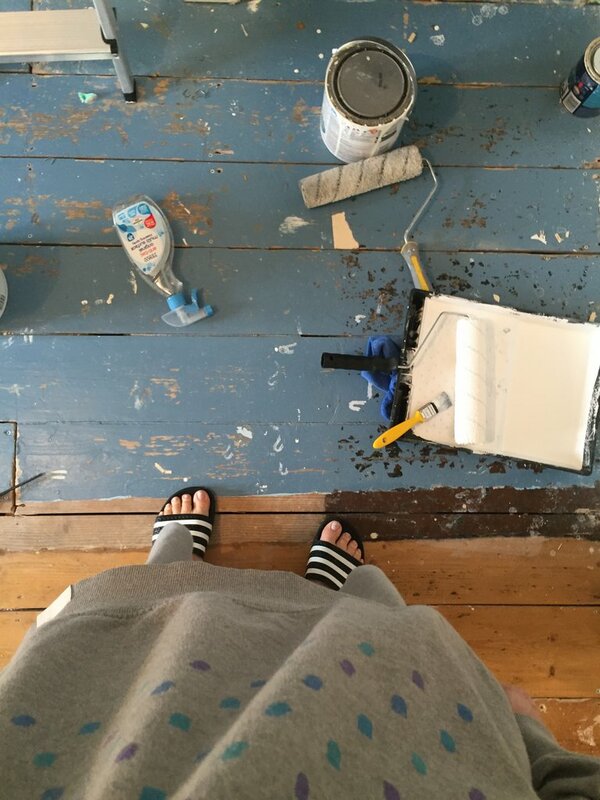 This was kinda a good result for me, as I have always dreamed of painted floorboards. 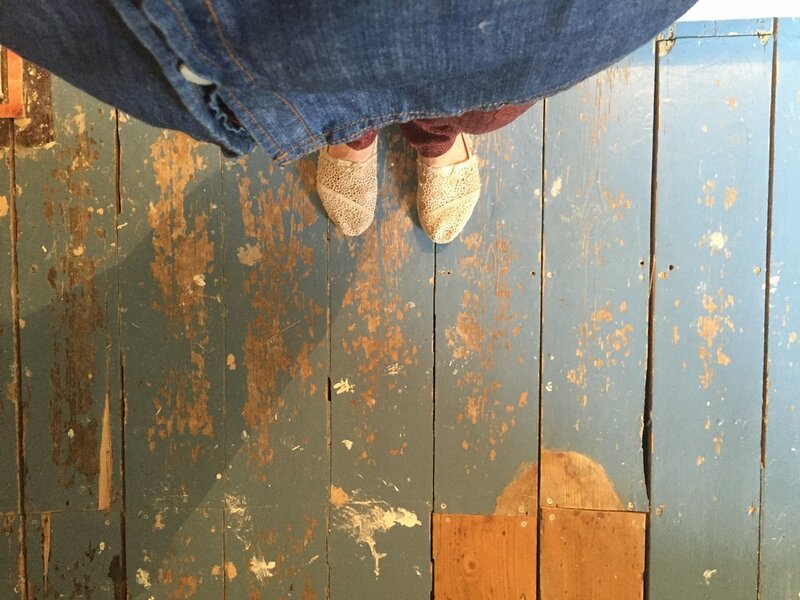 Every image I found on Pinterest seemed to have these glorious painted floorboards. 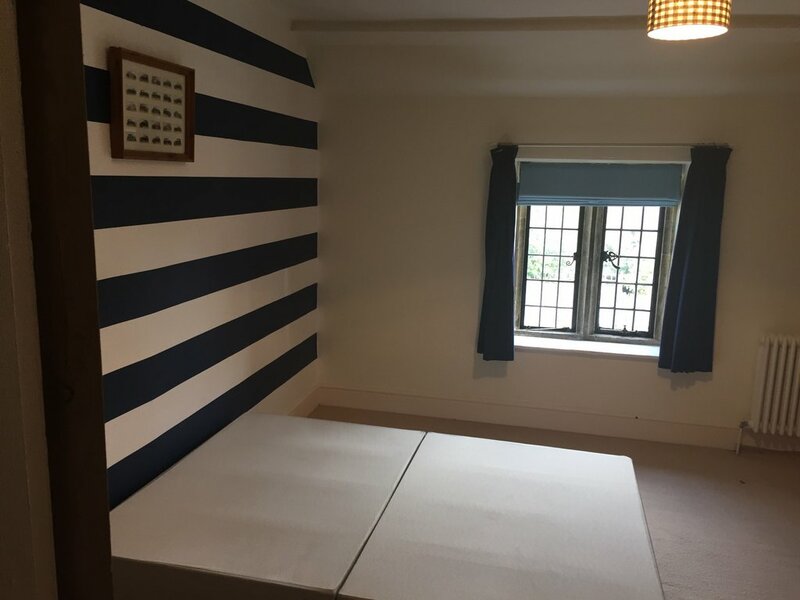 With the floorboards replaced, I finished painting the walls of the room and set about ordering some floorpaint from Farrow & Ball. 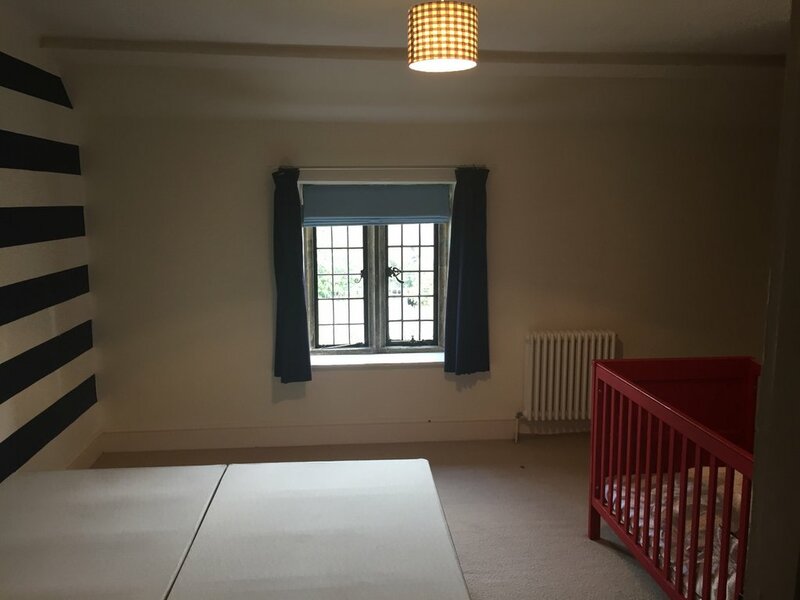 WIll reveal more once the nursery is finished - Can't wait to show you. Don't be afraid of the sparks. I was terrified that the sparks would ignite the dust underneath the floorboards but really don't worry . Your whole room would have to be filled with mounds of sawdust before that happened. Work along the grain of the boards, don't try and drive the sander back and forth. ride it forward, turn it off and drive it back and start again. It is tempting to treat it like a hoover but you ruin the machine that way. Try and get a sander that uses circular tube sanding papers - ask your hire company for help on this and what machines they have. I can't remember the name of the type of machine we had second time round but it was a game changer. Total cost was £60 and we saved masses of money but having the guy let us have the new machine for free over that last weekend. They need to actually disassemble the actual rolex replica as well as layer every element separately an additional component that provides substantially towards the price. Duramantan covered areas tend to be stated end up being regarding 2000 four thousand rolex replica sale within solidity, that is higher rolex replica to metal. Therefore, sturdiness ought to be instead amazing, meaning the actual color-coating is actually hard in order to put on away. Why 'm We therefore fired up through this particular. Nicely, for that greatest replica watches sale films happen to be limited by just a couple darkish rolex replica that are mainly dark as well as grey. Should you desired the steel view covered along with an additional colour, it might frequently have to be anodized light weight aluminum, the industry rolex replica gentle steel and never because long lasting because metal. Obviously, you will find ceramic wrist watches that are arriving a growing number of colours, however typically, whole ceramic instances continue to be mainly obtainable in just dark or even whitened.